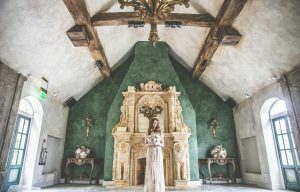 If the idea of a French Fantasy floats your boat then let us here at Le Petit Château help shape your wedding day into the day of your dreams. 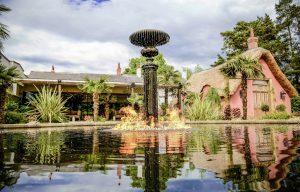 With many hosting spaces available for your vibe, picturesque decor, buildings and various ideas that you can implement into your day, make it one to be remembered at one of the most unique and daringly different Wedding Venues Northumberland has to offer. Your ceremony space can really set the tone for how you want your day to pan out. From the overall vibe you receive when you step inside, to the decor and the views, it has the power to translate feelings into words for yourself and your guests. We have the offer of three fantastic wedding spaces for you to tie the knot, catering to however large or small your entourage is, your tailored theme or general preference. Our Le Belle Epoque is our answer to the perfect French Chapel. For a French-inspired ceremony boasting with jaw-dropping beauty and high class, our pretty pink chapel is the perfect place to cement your love. 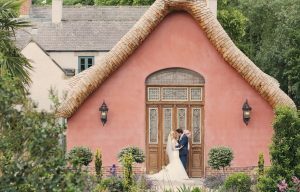 A wedding space combining romance and French fantasy, it is draped with a large crystal chandelier, marble fireplace and thatched roof – something like a storybook to tell your perfect love story. Our Mediterranean Terrace provides a bliss sanctuary for wedding ceremonies, breakfasts and evening receptions. If you are getting married in the height of summer, it provides the perfect backdrop to your special day out in the open, with an open sky above, outdoor firepits and exotic palm trees. However, if you are tying the knot during the colder months then you needn’t worry – our Mediterranean Terrace comes with a retractable roof so that you are protected from whatever weather Northumberland may throw your way! Our Chateau Ballroom provides a magical, enchanting setting to celebrate your love in. 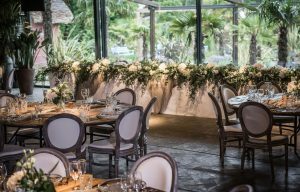 With a view of our Mediterranean Terrace as mentioned above, you really will feel transported to the peak of Parisian paradise through the interior, atmosphere and tasty treats served at your choice of our banquet style tables draped in delicate linen or rustic tables accompanied with Louis XIV chairs. A wonderful feature of our Chateau Ballroom is the way it has been designed – so that the bar and dance floor are merged together to keep the party going all night long. If you are racking your brains for meal ideas to suit everyone’s personal taste AND catering to your theme, then why not dilute the stress with the motion of a grazing table!? Grazing Tables can usually consist of a variety of meats, cheeses and fruits presented beautifully for your guests to nibble away on throughout the evening. Surprise your guests with a customised filter for your big day so that if they wish to post live videos or photos they can stamp mark it to your day! We love tradition here at Le Petit Chateau – but we also LOVE love and breaking the mould, stepping outside the box and providing our guests with quirky, exciting ideas. So why not ask your videographer to record messages from your loved ones wishing your marriage well and giving you a cheeky bit of advice. Perfect for adding personality and charisma to the memory box of your wedding! Are you familiar with Bongo Bingo? It’s a fun alternative to traditional bingo with hilarious prizes up for grabs, plenty of laughs involved and a wide selection of music to get every toe tapping in the room. Now available to hire for your big day – get in touch if this is something you would be interested in! If a French Fantasy is your dream wedding situation, then transport your guests to the Provence with us here at Le Petit Château! We aim to make all of your dreams come true and make the process as stress-free as possible, so give us a call today on 01830 570400 or pop in on our open day on Sunday 9 June between 2-4pm for any advice you need.